The verb “to clutter” now in our time comes true to its original meaning in 14th century English, “to heap up in piles, to litter”, or simply, “to clot”. Clutter does form clots; wherever it comes to rest, it finds its own, and binds together. In drawers, on shelves, in boxes, in closets, on horizontal surfaces, desks and tables and bureaus and ultimately on floors. But the clotting nature of clutter is not limited to physical objects. I am pestered and bedeviled and suffocated and confused as much by the clutter of ideas, fragments of information, memes, responsibilities, lists, lusts, fears and stalled projects in my head as by the thousand thousand objects to which I am attached by ownership, nostalgia or simple neglect. 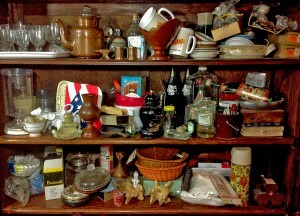 And so my parents inherited their parents’ clutter, and added it to their own, and it was good. But I have been busily building my own heap for fifty years, and sometime in the next few years the clutter I inherit, somebody else’s thousand thousand things will join their thousand thousand fellows already in my possession. I cannot do that math. Possession is the problem, isn’t it. My clutter is not your clutter, unless you have the misfortune to be married to me. Clutter begins with the pride of ownership, and one of the most difficult things in the world is to disown that which you once owned. You can convince yourself that it is not clutter by sorting it, organizing it, dusting it, putting it out of sight, keeping it because it doesn’t take up that much room, might be valuable, might be useful, might be just what another family member or friend wants; or because it’s interesting, or beautiful, or retro or tacky, or reminds you of happy times from long ago, or because it’s the only one you have or because it’s the slightly broken member of a set which can easily be glued back together—or reglued for the third time— when you have the time. You can even muster the courage to give some of it away, and having done that assure yourself that you can deal with the rest of the stuff, including the new stuff you just brought into the house which is fresh and not yet susceptible to clotting. But as soon as you’ve finished doing whatever it is you feel good about doing with your clutter and turn your back on it, the stuff simply returns to doing what it does best. It finds more of its own kind and through a special form of gravity unique to the physics of clutter, forms little black holes from which no light or meaning or usefulness escapes. Today is January 1, 2015. I’m looking at our Christmas tree and realizing that we should take it down today or tomorrow. It’s done its job. There are perhaps 50 ornaments hanging from its branches, most of which have some little story attached to them, some going back more than half a century, purchased or made by people long dead. Each year when we decorate the tree, we refresh our memory of the stories with a comment or two. We reinvest those objects with meaning, and so when we put them back in the box it is almost as though they’ve been inoculated against becoming clutter. They have a purpose. We need them and use them with intent in their proper time and place. 20 years ago I decided I would try to make a collection of parrot things. I lived with a real parrot then, and at least had the good sense not to bring any more live parrots into the house. I’ve known people who collect live parrots. They were all nut cases. I began to collect ceramic parrots, plastic parrot whistles, parrot branded foods…you get the idea. In the course of about five years I accumulated more than a hundred objects. People learned of my collection and began giving parrot stuff to me. It was a remarkable collection. I put much of it out on display, and it took up the better part of a half of my office. Most of the stuff collected dust (it’s strange isn’t it, our collections, having little else to do with their time, collect dust), which disturbed me, and I tried to keep up, but could not. I could have put the stuff in glass cases, but that seemed extreme and expensive. And then, five or six years ago, my actual, living parrot died. Quite suddenly my collection became tiresome and annoying to me. I threw it all in boxes and moved it to the garage where it has clotted and become clutter. I hate it but have not been able to get rid of it. The stuff has no meaning or purpose in my life, and yet I cannot let it go. I have no nostalgic connection to it, there is nothing valuable in it, and if anything it reminds me of a time in my life which, shall we say, was not my finest. What’s really going on here? I dunno. I’d be thrilled if somebody stole my parrot collection. But barring that, wherever I go, there it remains. It’s a new year. 2015. Perhaps it is a good year to throw some stuff out. This is not a resolution. Call it an inclination. No, I dissemble. The clutter thing is really a problem. I must thrash my way out of it; I must get free of it, lest I become it. I have sometimes wondered whether our ancestors buried their dead with their stuff not so much to give the departed something to carry into the afterlife as to get rid of the clutter in this life. Previous PostFractal #37: Boy saves smiley guy from fireNext PostSpace, 1957: What’s up in the sky?